BEFORE: To wrap up horror week is the Stanley Kubrick masterpiece and easily my favorite horror movie, The Shining. Yes, I have seen The Shining before, in fact I watched it last year on Halloween as well (I’m making it a tradition). But while this film doesn’t fall under the usual unseen film, or the rare seen-it-but-forgot-it, I still think putting The Shining through the paces of the movie marathon will be very beneficial. 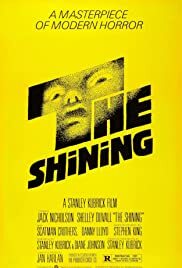 Despite knowing that I very much enjoy this film, I’ve never looked at it critically or written down my thoughts about it and that’s a new aspect I’m interesting in exploring about The Shining. Another note to make is that today marks the end of four months of film and with that comes another statistics update. October adds 3,423 minutes or 57 more hours of film and 15,280 words describing my opinions. Totals for the marathon have now reached 14,117 minutes or just under 10 days of moving images accompanied by 53.857 words, or the length of an average novel. As I enter the fifth month, I’m finding that the marathon can be very taxing. I’m finding that writing my reviews comes a bit easier now than it did at the beginning, but finding the time has gotten a bit tougher as school and other activities have picked up. I still continue to enjoy this process a lot and have no plans on stopping. If anything, it has forced me to work on my time management even more. And as always, I thank everyone who has read my thoughts, for without you, my voice would go unheard. But where were we? That’s right, The Shining. AFTER: “All work and no play makes Jack a dull boy.” That of course is the famous line that Jack Torrance writes repeatedly during his long stay at the Overlook Hotel. I think this quote represents everything that makes The Shining such an amazing film. For starters, there is a great balance between suspense and calm or (work and play to quote the film). This is what the whole story is about: a family maintaing a hotel, alone, all winter. Kubrick makes the progression from beginning, when everyone is sane and loving, to the end, when minds are lost and violence unfolds, very seamlessly. Bit by bit you see the characters dipping their toe in the water, then taking it back out, then walking in waist-deep, and back out again before the final plunge. Throughout the movie there is a very fine line between suspense and calm until finally all hell breaks loose and the line is obliterated. How is it that Kubrick accomplishes this masterful feat of storytelling? The answer is that every element to the film combines to create a spectacle with such attention to detail that is rarely seen. I will be focusing mainly on the production design and cinematography, but I’ll also briefly touch on the music and the acting as well. Saying the Kubrick payed attention to detail is an understatement but it can also seem a bit counterintuitive for The Shining. If you pay really close attention to the production design of the Overlook Hotel you will notice many things that simply don’t make sense. If you want a highly detailed overview on these inconsistencies, check out this video that talks about how the design of The Shining psychological manipulates the viewer (WARNING: major spoilers included in the video series. Recommended viewing for after you’ve seen The Shining; viewer discretion advised). You will soon notice that the layout, patterns, shapes, and colors are all contributing to a consistent mysterious atmosphere and a sense that something just isn’t right. Complementing the production design is the cinematography and camera work. With many wide shots, large depth of fields, and one of the first uses of the Steadicam, Kubrick uses the camera as an extension of the film, again adding to the feeling of peculiarity, and another manipulation of how the viewer sees the film. Very briefly, the music and acting. Both also contribute to the overall feel of the film in more obvious ways than the design and camera do. For a sense of the music, just listen/watch the opening sequence to the film and you’ll immediately get the music. All it takes is a couple of notes and you can just hear the suspense and strangeness; it’s the visuals in audio form. And then there’s the acting. Superb performances by Jack Nicholson (last seen in Anger Management) as one of the greatest villains, Jack Torrance and Danny Lloyd as the supernatural Danny Torrance. Not so much with Shelly Duvall’s performance as Wendy Torrance (the film needs a weak link somewhere). The reason I typically don’t like horror films is because they usually fail in a key area; scare-factor… with horror though, I have the advantage of having seen many films in the genre so I’ve gotten past the notion that the film isn’t good if it doesn’t scare me. The Shining fails this test and yet I consider it the best horror film of all-time (and my favorite Kubrick film). The reason being is there is so much more to horror than a frightening shock. I look for this in most horror films because generally they are trope-ridden, franchise-building, one-weekend hits made to drum up scares at Halloween time. Where The Shining shines (see what I did there) is that it’s a well-made film that happens to be in the horror genre. The production design and cinematography alone are enough to make this film fantastic; the music, acting, and everything else turn into a legendary film. Everyone, whether you are a horror fan, Kubrick fan (or not), film buff, or even just a casual moviegoer, The Shining needs to make it onto the list of movies you’ve seen.